Suggested Fishing Locations (by species) - select the tab to expand selection. PLEASE NOTE: This is not intended to be an exhaustive list of all available fishing locations. It is a list of suggested locations compiled by fisheries biologists who live and work in the region. American Shad Salmon Falls River. Black Crappie Bear Hill Pond & Spruce Pond (Allenstown), Merrimack River (Franklin to Hooksett), Big Island Pond (Derry), Massabesic Lake (Auburn), Powwow River (East Kingston), Great Pond, Greenwood Pond & Country Pond (Kingston), Scobie Pond (Londonderry), Pawtuckaway Lake & Round Pond (Nottingham), Arlington Mill Reservoir (Salem), Angle Pond (Sandown), Canobie Lake (Windham), Ayers Pond (Barrington), Bellamy Res. (Madbury), Willand Pond (Somersworth), Turtletown Pond (Concord), Brindle Pond (Barnstead), Wheelwright Pond (Lee), Winkley Pond (Barrington), Contoocook River, and Hoit Road Marsh (Concord), Harvey Lake (Northwood). Bluegill Big Island Pond (Rockingham), Massabesic Lake (Auburn), Lamprey River (Deerfield, Northwood), Merrimack River, Hood Pond & Beaver Lake (Derry), Scobie Pond & Kendal Pond (Londonderry), Arlington Mill Reservoir (Salem), Cobbetts Pond (Windham), Brindle Pond & Lily Pond (Barnstead), Deer Meadow Pond (Chichester), Horseshoe Pond (Concord), Kimball Pond (Dunbarton), Swain Pond (Barrington), Bellamy Reservoir (Madbury), Contoocook River (Broad Cove), and Crooked Pond (Loudon), Heads Pond (Hooksett), and other small warmwater ponds. Brook Trout Suncook River (Barnstead to Pembroke), Baboosic Brook (Merrimack), Archery Pond, Catamount Pond, and Bear Brook (Allenstown), Sanborn Brook (Chichester), Little Suncook River (Epsom), Clough Pond (Loudon), Hothole Pond (Loudon,Concord), Soucook River (Loudon,Pembroke), Big Island Pond (Derry), Massabesic Lake (Auburn), Tower Hill Pond (Candia), Exeter River (Sandown to Exeter), Exeter Res. (Exeter), Lamprey River (Deerfield to Durham), Lucas Pond (Northwood), Stonehouse Pond (Barrington), Isinglass River (Barrington, Strafford), Beaver Brook (Derry to Pelham), Winnicut River (N. Hampton to Greenland), Beaver Lake (Derry), Piscataquog River (Goffstown), Canobie Lake (Salem), Isinglass River (Barrington,Strafford), Big River (Barnstead, Strafford), and Barbadoes Pond (Madbury). Brown Trout Suncook River (Barnstead to Pembroke), Beaver Brook (Derry to Pelham), Big Island Pond (Derry), Exeter River (Sandown to Exeter), Lucas Pond (Northwood), Massabesic Lake (Auburn), Bow Lake (Strafford), Lamprey River (Deerfield to Durham), Cocheco River (Dover), Little Suncook River (Epsom), Merrimack River (Concord), Soucook River (Epsom to Pembroke), and Pleasant Lake (Deerfield), Tower Hill Pond (Candia), and Berry Brook (Rye). Hornpout Hoit Marsh (Concord), Turtletown Pond (Concord), Turkey Pond (Concord), Morril Pond (Canterbury), Harvey Lake (Northwood), Bow Lake (Northwood), Pawtuckaway Lake (Nottingham), Kimball Pond (Dunbarton), Beaver Lake (Derry), Powwow Pond (Kingston), Onway Lake (Raymond), Swains Lake (Barrington), Merrymeeting Marsh (New Durham), Ayers Lake (Barrington), Country Pond (Kingston), Upper & Lower Suncook Lakes (Barnstead), and Arlington Mill Reservoir (Salem). Carp Merrimack River (south near Garvin's Falls/Bow Dam) and Nashua River. Chain Pickerel Arlington Mills Res. (Salem), Suncook Lake (Barnstead), Lily Pond (Barnstead, Pittsfield), Blake Pond (Pittsfield), Sanborn Pond (Loudon), Merrimack River, Heads (Lakins) Pond (Hooksett), Turkey Pond & Turtletown Pond (Concord), Gorham Pond & Kimball Pond (Dunbarton), Deer Meadow Pond (Chichester), Stumpfield Marsh (Hopkinton), Hood Pond (Derry), Jenness Pond (Northwood), Freeses Pond & Shingle Pond (Deerfield), World End Pond (Salem), Kendall Pond (Londonderry), Cobbetts Pond (Windham), Lily Pond (Somersworth), Mendums Pond & Ayers Pond (Barrington), Bellamy Reservoir (Madbury), Pawtuckaway Lake (Nottingham), and Taylor River (Hampton). Fallfish Numerous medium to larger sized rivers. Largemouth Bass Brindle Pond, Lougee Pond & Suncook Lake (Barnstead), Lily Pond (Barnstead, Pittsfield), Chestnut Pond & Odiorne Pond (Epsom), Crooked Pond (Loudon), Deer Meadow Pond (Chichester), Gorham Pond & Kimball Pond (Dunbarton), Heads (Lakins) Pond (Hooksett), Horseshoe Pond & Turkey Pond (Big) & Turtletown Pond (Concord), Merrimack River, Morrill Pond (Canterbury), Wild Goose Pond (Pittsfield), Angle Pond (Sandown), Arlington Mill Reservoir (Salem), Beaver Lake (Derry), Big Island Pond (Atkinson, Derry, Hampstead), Canobie Lake & Cobbetts Pond (Windham), Harvey Lake & Jenness Pond (Northwood), Massabesic Lake (Auburn), Pawtuckaway Lake (Nottingham), Country Pond, Powwow Pond & Great Pond (Kingtson), Ayers Pond & Mendums Pond & Swain Pond (Barrington), Wheelwright Pond (Lee), Willand Pond (Somersworth), Bellamy Reservoir (Madbury), and Turee Pond (Bow). Pumpkinseed Most lakes, ponds and medium to large rivers. 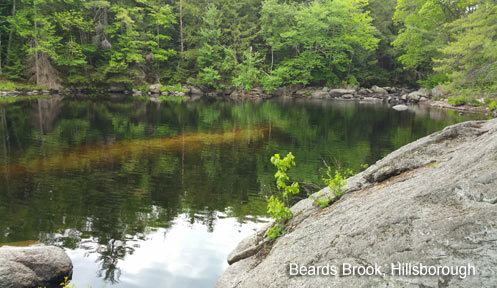 Rainbow Trout Suncook River/Lake (Barnstead to Epsom), Clough Pond (Loudon), Hothole Pond (Loudon/Concord), Soucook River (Loudon, Pembroke), Exeter River (Sandown to Exeter), Exeter Res. (Exeter), Winnicut River (N. Hampton to Greenland), Lucas Pond (Northwood), Massabesic Lake (Auburn), Big Island Pond (Derry), Beaver Lake (Derry), Lamprey River (Deerfield to Durham), Canobie Lake (Salem), Isinglass River (Barrington,Strafford), Baboosic Brook (Merrimack), Archery Pond (Allenstown), Isinglass River (Barrington, Strafford), Beaver Brook (Pelham), Bow Lake (Strafford), Beaver Brook (Derry to Pelham), Pleasant Lake (Deerfield), and Willand Pond (Somersworth), Cocheco River (Dover), Piscassic River (Newfields), Barbadoes Pond (Madbury), Tower Hill Pond (Candia). Rock Bass Nashua River and Contoocook River. Smallmouth Bass Suncook Lake (Barnstead), Merrimack River, Rocky Pond (Loudon, Canterbury), Massabesic Lake (Auburn), Big Island Pond & Beaver Lake (Derry), Jenness Pond (Northwood), North River Pond (Northwood, Barrington, Nottingham), Pleasant Lake (Deerfield), Onway Lake (Raymond), Phillips Pond & Angle Pond (Sandown), Sunset Lake (Hampstead), Northwood Lake (Northwood), Pawtuckaway Lake (Nottingham), Arlington Mill Reservoir (Salem), Canobie Lake & Cobbetts Pond (Windham), Country Pond (Kingston, Newton), Greenwood Pond (Kingston), Scobie Pond (Londonderry), Bow Lake (Strafford), Mendums Pond & Ayers Pond (Barrington), Wheelwright Pond (Lee), and Cocheco River (Dover). Walleye Contoocook River and Merrimack River. White Perch Suncook Lake & Brindle Pond (Barnstead), Gorham Pond (Dunbarton), Eel Pond (Rye), Massabesic Lake (Auburn), Big Island Pond (Derry), Northwood Lake & Harvey Lake (Northwood), Pleasant Lake (Deerfield), Pawtuckaway Lake (Nottingham), Arlington Mill Reservoir (Salem), Bow Lake (Strafford), Wheelwright Pond (Lee), Ayers Pond (Barrington), Willand Pond (Somersworth), Contoocook River, and Merrimack River. Yellow Perch Nearly all lakes, ponds and medium to large rivers. American Shad Connecticut River below Vernon (Vernon, VT) and Bellows Falls (Walpole, NH) Dams. Bluegill Connecticut River, Child’s Bog (Harrisville), Cheshire Pond (Jaffrey), Meetinghouse Pond (Marlborough), Grassy Pond (Rindge), Center Pond (Stoddard), Swanzey Lake & Wilson Pond (Swanzey), Halfmoon Pond (Hancock), MacDowell Lake (Peterborough), Waterloom Pond (New Ipswich) and other small warm water ponds. Brown Trout Cold River (Alstead/Walpole), Contoocook River (Hillsborough/Jaffrey/Henniker), Forest Lake (Winchester), Gilmore Pond (Jaffrey), Laurel Lake (Fitzwilliam), Newell Pond (Alstead), Warren Lake (Alstead), South Branch Ashuelot River (Swanzey/Troy), Ashuelot River (Gilsum/Marlow/Surry/Winchester), Blackwater River (Webster), Cold River (Alstead/Walpole), Souhegan River (Greenville/Amherst), Beards Brook (Hillsborough), Piscataqoug River (Goffstown), South Branch Piscataqoug River (New Boston), Island Pond (Washington). Largemouth Bass Deering Reservoir & Dudley Pond (Deering), Connecticut River, Center Pond (Nelson), Stumpfield Marsh (Hopkinton), Monomonac Lake (Rindge), Highland Lake (Stoddard), Harrisville Pond & Skatutakee Lake (Harrisville), Spofford Lake (Chesterfield), Warren Lake (Alstead), Pleasant Lake & Shattuck Pond (Francestown), Scott Pond (Fitzwilliam), Crescent Lake (Acworth) and most warm water ponds. Northern Pike Connecticut River and backwaters (Woodsville to Mass. border), Spofford Lake (Chesterfield), Wilson Pond (Swanzey) and Skatutakee Lake (Harrisville). Walleye Connecticut River (Woodsville south to Mass. border).